Various types of information processing occur in quantum systems. The most fundamental processes are state discrimination and hypothesis testing. These problems often form the basis for an analysis of other types of quantum information processes. The difficulties associated with the noncommutativity of quantum mechanics appear in the most evident way among these problems. 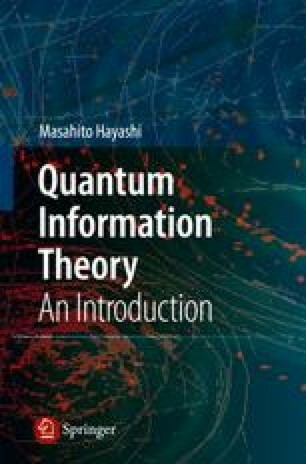 Therefore, we examine state discrimination and hypothesis testing before examining other types of information processing in quantum systems in this text. In two-state discrimination, we discriminate between two unknown candidate states by performing a measurement and examining the measurement data. Note that in this case, the two hypotheses for the unknown state are treated symmetrically. In contrast, if the two hypotheses are treated asymmetrically, the process is called hypothesis testing rather than state discrimination. Hypothesis testing is not only interesting in itself but is also relevant to other topics in quantum information theory. In particular, the quantum version of Stein’s lemma, which is the central topic of this chapter, is closely related to quantum channel coding discussed in Chap. 4. Moreover, Stein’s lemma is also connected to the distillation of maximally entangled states, as discussed in Sect.8.5, in addition to other topics discussed in Chap. 9. The importance of Stein’s lemma may not be apparent at first sight since it considers the tensor product states of identical states, which rarely appear in real communications. However, the asymptotic analysis for these tensor product states provides the key to the analysis of asymptotic problems in quantum communications. For these reasons, this topic is discussed in an earlier chapter in this text.